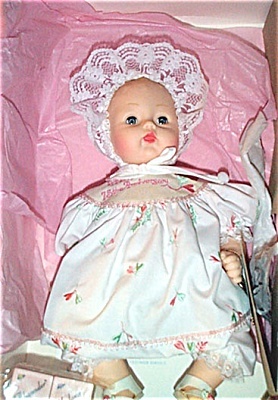 Madame Alexander 1998 Fall Collection 12 inch 75th Anniversary Huggums baby doll with soft vinyl head and soft cloth body, blonde sprayed and molded hair, and blue moving eyes. Her ensemble includes white taffeta pantaloons, a white dress with pink and green floral embroidery that says 'Happy 75th Anniversary' on the bodice, pink looped lace trim, matching bonnet with white lace, white sandals with pink rosebuds. Accessories include 2 blocks with numbers and Madame Alexander printed on them (made out of wood or plastic-like wood). 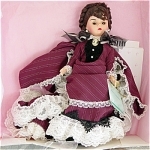 This very special old stock doll is mint-in-the-box with tag and came directly from Alexander Doll Co. Expand listing to view both photographs.